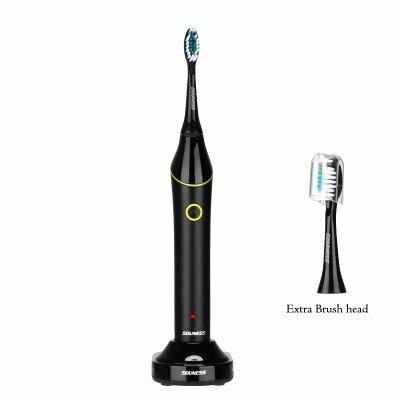 Successfully Added SOUNESS Sonic Electric Toothbrush - 3 Cleaning Modes, 3500 Strokes Per Minute, IPX7 Waterproof, 750mAh, Advanced Gum Care to your Shopping Cart. Enjoy pearly white teeth and healthy gums thanks to the SOUNESS Sonic Electronic Toothbrush. This electric toothbrush provides you with professional-grade oral care and cleanses even the most difficult to reach areas of your mouth. Thanks to its state of the art design this toothbrush will thoroughly clean and aid your teeth. Compared to regular and manual toothbrushes, the SOUNESS Sonic removes more dirt and provides a more advanced cleaning method. This guarantees the reduction of plaque build-up and furthermore supports the whitening of your teeth. With its three different cleaning modes, this electronic toothbrush is sure to meet the needs of anybody out there. Its regular cleaning mode will thoroughly cleanse your teeth and reduces plaque build-up. For people with sensitive gums, this health gadget features a special mode that allows you to softly brush your teeth without hurting your mouth. Finally, it also features a whitening mode that will make your teeth shine bright like never before. From now on, you’ll be able to laugh again with confidence as this electric toothbrush will treat you with the white and healthy teeth that you’ve always dreamt of. This Sonic toothbrush comes with a powerful 750mAh battery that brings along weeks worth of usage time. Thanks to this, you’ll be able to enjoy its professional oral treatment without constantly needing to worry about recharging your device. It furthermore features an IPX7 waterproof design. This makes your electric toothbrush completely safe to use. By reaching up to 3500 strokes per minute, your new electronic toothbrush will thoroughly clean your mouth whilst you are barely moving your hands. It furthermore features a simple 1-button design. This brings along great ease and efficiency for people of any age. If you’re looking for a great gadget that improves the health of your teeth and gums, the SOUNESS Sonic Electronic Toothbrush is perfect for you. This toothbrush comes with a 12 months warranty, brought to you by the leader in electronic devices as well as wholesale electronic gadgets..